Everyone has said the prevalence of hypertension is on the rise. Do you know why? I think one major contributor is the industry. Wherever, the industry goes the prevalence of hypertension increases. You can always cross check this report, and here we have the industry who is trying to tell us to educate each one of us to treat hypertension. The second paradox is we, ourselves. 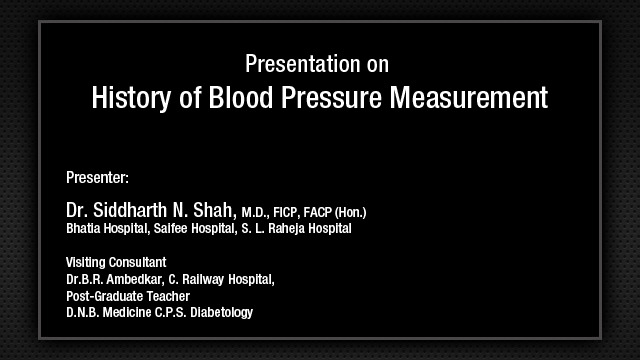 We are going to teach and learn about how we should treat hypertension and immediately after this we are going to go out and indulge in three major contributors of hypertension, the salt, the alcohol and the so called lazy sleep after that including some people with obstructive sleep apnea. The third paradox is in the topic itself. 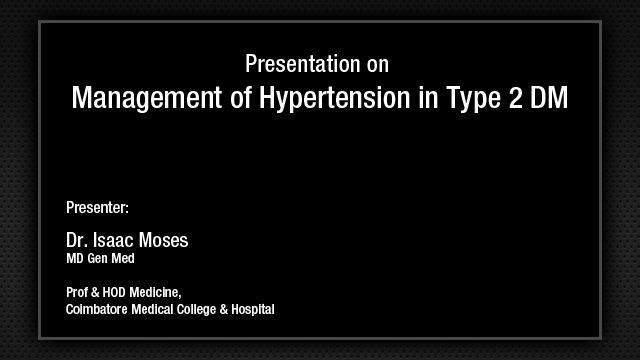 I thought probably I had to speak on the hypertension causing the chronic kidney disease which is a second major contributor of end-stage renal disease, but here I have to talk on management of hypertension in end-stage renal disease and I was very lucky to see two good nephrologist friends of mine who were in the audience. I hope they are in the audience, I do not see them, but I met them outside, and I thought that at least some of them are going to understand what I am going to speak on. The fourth is of course the timings. We all have been given just 15 to 20 minutes of course the VIPs are given half an hour, Dr. Sawhney has half an hour and all of us are spending as much amount as possible, so timing is also a paradox. The last paradox which I heard from Dr. Sawhney only, very interesting that since the time MCI has made these restrictions of pharma versus physicians, the number of pharma sponsored presentations and conference have increase manifold. 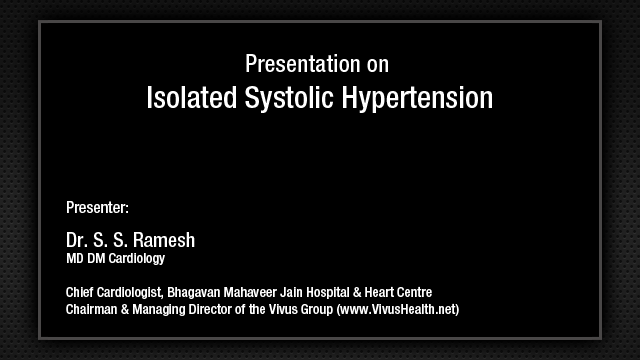 So I do not know whether my talk, you are going to decide, but in next probably 20 to 25 minutes, whatever the time is given to me, I am going to talk to you about why this hypertension, again a paradox, of so called reverse epidemiology, in fact, in patients on dialysis the higher the blood pressure the better it is, but still I would like to about the epidemiology, etiopathogenesis, target blood pressure, how do we assess blood pressure in hemodialysis, is it predialysis or is postdialysis, is it weekly, is it ambulatory, or therapeutic options, resistant hypertension. The first, of course, I always try and emphasize to my physician friends, kindly, kindly, kindly make a diagnosis of CKD based on 2 factors, the serum creatinine, take out your calculators and just calculate the eGFR and if the patient's eGFR is less than 60, there is no doubt that he has CKD irrespective of what his serum creatinine is and if the patient has a urine dipstick which we always order, but hardly see of 1+ or a renal cyst plus his eGFR is more than 60, he still continues to have stage 1 or 2 CKD and we must must focus on the action plan of what we must do and what I am trying to focus, today's discussion is on the stage 5. Stage 5 has also 2 component, most of our stage 5 are actually are not on dialysis, ideally they should be on, but they all do not want to have dialysis, they have a denial. In fact the doctor is changed if the patient is advised a dialysis, but of course 5D when they are on dialysis and 5T when they have undergone transplantation. Now, as was alluded, almost 70 to 80% of patients who are in stage 3 to 5 CKD have hypertension, when you define it with value of 140/80. It is, no doubt, a risk factor for progression of both a chronic kidney disease and cardiovascular mortality and it is one of the major major causes. In fact in CKD, patients die much more of courtesy cardiologist's problems and less of dialysis population and we need multiple multiple regimens, but what is interesting is that almost universal or 86% of patients who are on dialysis have a high blood pressure and most of these patients are on antihypertensive’s, thus, there is no doubt, my friend was telling me that you give more than 5 antihypertensive drugs without any rationale, but when we generally do an ambulatory blood monitoring, we find that most of them as was alluded by Dr. Ramesh, they are having a systolic hypertension. However, the same thing when we try and find the prevalence in an unselected hemodialysis population the prevalence is just 37%, so there lies the importance of doing an ambulatory blood pressure monitoring to come to this. Now, one of the major factors for high blood pressure in a patient who is on dialysis is hypervolemia. In fact, if you really have to control his high blood pressure, the only thing we need to do is not to tell him not to drink water, but to curtail his salt because it is the salt which is the basic proponent of hypervolemia and thus increased weight gain and hypertension in these patients. Of course, we have erythropoietin, somewhat contributor, of course the doses which we used to use were much much higher, now as the levels are lower, but that can also contribute. There are nontraditional risk factors in patients who have a CKD on end-stage renal disease and on dialysis, one including hyperparathyroidism, calcification. In fact with the advent of the technology, CT and MRI in fact almost of our patients in practice that is what I am doing for last one year, gets a CT done and there you see a good calcification of whole of aorta when you go out of the radiology department to see their CTs. One of the major things which has come out recently in management of refractory hypertension and Dr. Suresh was asking me whether you are going to discuss renal sympathetic ablation, increased sympathetic activity is one factor which also contributes to significant hypertension. Of course, we all talk about RAAS and also RAAS also plays an important role. Now, what should be the target blood pressure. We all are aware about K/DOQI guidelines, which were started around a decade back which actually gave this classification and then gives us the target to follow, we hardly follow that, and less than 140/90 in the predialysis always the patient has higher reading and 130/80 in the postdialysis, what one must try and achieve. Generally, also it is also suggested that a mean blood pressure of a patient who is on dialysis should be less than 100, but look at the blood pressure variability in such cases. When you start a dialysis of a patient, his blood pressure typically will be around 150/90. He will have a weight gain of more than 3 kg interdialytic and as we proceed in the next 2 to 3 hours, the blood pressure might drop to 118/60 and also again towards the end to rise to 140/80, so there is a significant amount of variability, which can be because of interdialytic weight gain, the higher the weight gain, the higher the predialysis, often very low during dialysis due to fluid removal, stress of actually getting into a hemodialysis unit and you can always see their faces. They are all dependent on machines and they have very sympathetic overactivity. Skipping the blood pressure, now there is a huge paradox again, whether we should take antihypertensive drugs before the dialysis and of course look at the way the nurse has to measure the blood pressure during the dialysis, for each patient thrice or every half hourly, non-standardized blood pressure technique. All these are responsible for the variability of the blood pressure. Here in a very elegant study done and published around a decade back showed that there was a variation of pre as well as the postdialysis of significant amount of almost 14 mmHg as compared to the standard reading. The standard reading is what was told to us by Dr. Siddharth Shah in his first deliberation as to how one should measure the blood pressure. Significantly postdialysis also there was difference in the reading. In another study in Toronto, they found that the difference in the blood pressure, the TRU blood pressure versus the Unit blood pressure was as high as systolic 27 and diastolic 30. So, white coat effect, again an effect of the dreadful nephrologist or a technician barking at you to stop all those things is what is the affect of the blood pressure, but more importantly what should we assess, which blood pressure, during the dialysis, before the dialysis, after the dialysis, what are the choices. We all talk about ideal choice and now we are more and more moving towards so called home blood pressure measurements, specially true for our patients, who are on end-stage renal disease and on dialysis. Ambulatory blood pressure is ideal, but of course not very practical. I do not know how many of your institutions have this. We have recently acquired it and I have tried to use it, but physicians are not happy. We just charge Rs. 2000, but it is one of the most important component for us because most of the patients with end-stage renal disease are so called non-dippers, i.e., their blood pressure does not sleep at night unlike their own self also and they are the ones who are more likely to contribute, of course, BP on non-dialysis day and what has been concluded is that the mid week medium blood pressure during dialysis with a systolic cutoff of 140 has an 80% sensitivity and 80% specificity. So, that is what is generally recommended, ask the patient to get his blood pressure checked daily, take a mean out of it and then this is what one of the very elegant study, the DRIP study had shown. Now, which components? Again, we have talked about both systolic as well as diastolic, a high prevalence of isolated systolic hypertension does exist, but clinical decision in managing interdialytic blood pressure should be based on both systolic as well as the diastolic. But again, as I said a paradox, is high blood pressure in hemodialysis patient good or is it bad? In fact, studies done in huge populations, so called observational studies had shown a reverse epidemiology, i.e., lower BP was associated with poor short-term outcomes, again theat J-curve hypothesis. Probably, more malnourished, less likely to have, you know a good nutrition and thus more likely to have adverse outcomes. However, recent randomized control trials have suggested that probably the higher blood pressure may be associated with adverse outcomes. Again, one of the studies, 596 incident hemodialysis patients, echocardiogram done from 1-1/2 to 6 years left ventricular mass index increased significantly, systolic blood pressure predicted increase in the left ventricular, predicted death and cardiovascular. Again, whether it is the systolic component or the blood pressure per se, but definitely it was associated with adverse outcomes. So was another study, a single center study, followed up for 3 years, studied 3 different methods of blood pressure monitoring, 4 quartile, the fourth quartile with the highest blood pressure had a highest hazard ratio of mortality, so probably again thus truly newer data suggest that higher blood pressure associated with greater risk of left ventricular hypertrophy and thus being a risk factor for adverse outcome may have an adverse outcome, similarly probably a home blood pressure measurement might be beneficial. Now, what are our therapeutic options to normalize blood pressure. Unlike a patient who does not have a renal failure or is not on dialysis, we always harp upon lifestyle modification and drugs, but here we have apart from lifestyle modification, more important is the control of volume status in dialysis. In fact if a patient undergoes 3 or 4 times a week dialysis and has interdialytic weight gain of less than 2 kg, that is an ideal method of controlling his blood pressure, however, short daily dialysis, nocturnal hemodialysis, dialysis, salt and fluid restriction in combination with dialysate sodium concentration. Here comes the role of so-called sodium profiling. Again, I was told by one of my colleagues that we have 600 dialysis centers, but probably in Delhi there would be very few centers where a nephrologist would visit. Most of them are handled by technicians and if you ask them about sodium profiling they will laugh at you. Again, a very important thing, lifestyle. I am not going to dwell into greater details except to say, if we are able to convince our own patients of asking them to eat just 2 g of salt which is absolutely difficult to achieve is what an ideal thing in patients who are on dialysis, but unfortunately, we are not able to convince them and of course regarding alcohol, we have to be convinced ourselves first. Obesity, again a very very important problem nowadays among patients who are on dialysis, of course most of them are malnourished, but as we grow in affluence type of patients are changing, so obesity is also becoming one of the very important factor. As I said, volume status is one of the very important thing in controlling the body sodium content with extracellular fluid allows one to better control hypertension. In fact, if the patient's sodium before the dialysis was 135 and you are dialyzing the patient with 146 mEq you are in fact giving him almost 3 to 4 g of extra sodium and that will induce thirst and that will result in volume overload and hypertension. So, we need to actually understand that mean predialysis sodium plus hemodialysis should be less than 140 mEq and there are other things which we need to look at, especially meant for nephrologist. So, there lies an importance of extracellular fluid volume and total body sodium. The conclusion is, minimize the interdialytic weight gain. If you really want a meaningful result of your high blood pressure, we must must reduce the interdialytic weight gain. Now what about the antihypertensive therapy? Somehow most of the Indian nephrologists are afraid of using ACE inhibitors or ARBs in the hemodialysis population, but that is one of the best drug to control blood pressure both because it has effect of renin and angiotensin axis, but also it decreases left ventricular hypertrophy and has a good effect on sympathetic overactivity. However, the most commonly used antihypertensive drugs are calcium channel blockers. Beta blockers in combination of calcium channel blockers also have an important role to play. Diuretics, per se, as antihypertensive agents do not have any role. Similarly, there have been a good number of studies including a very famous HEMO study which has shown that 72% of hemodialysis patients receiving antihypertensive medication, which included both calcium antagonist, most of them received angiotensin converting enzyme and beta blocker. Of course, as we have to look at the other comorbidities including cardiovascular disease, the pharmacokinetic of the drug, beta blocker if you use atenolol, you are more likely to have an outcome of bradycardia rather than effect on high blood pressure, so we need to be very careful in that and as I have alluded to renin-angiotensin aldosterone blockers are one of the very key drug. Regarding the potassium, one can always suggest them to reduce their potassium intake during the interdialytic period. We know that once the patient is on dialysis, the potassium can go up. So, again the same algorithm, the patient has angina, we can use beta-blockers and calcium channel blockers. If the patient is post MI, which is again a common phenomenon amongst dialysis patient, beta-blocker. Hypertrophic cardiomyopathy, heart failure, again ACE inhibitors or beta blockers. Bradycardia, we do not use beta blockers and asthma of course similar. I will not go into the details of individual drugs. There have been a good number of studies on almost individual drug and again this algorithm is almost similar that we have to ask the patient to choose from the lifestyle. If they had chosen lifestyle, they would not have actually reached to that stage of end-stage renal disease. The blood pressure target should be same, hypertension without compelling indications. We start ACE inhibitors, ARBs or a 2-drug combination, hypertension with compelling indication, again the drugs. If not at goal, add beta-blockers, of course centrally acting drugs like clonidine and moxonidine are being more frequently used by us, workup for a secondary cause and in one patient we had an opportunity to do that renal sympathetic ablation, now of course, it has come up as one of the major major instrument, I do not know how many centers are doing it, but we were lucky to have a video presentation last time from Dr. Rao who showed us how renal sympathetic ablation can result in a significant reduction in resistant hypertension and we all are well aware about what are the causes. Now again, I had started with my paradox and I told you that and I will also end with a paradox, now sometimes occasionally, after the dialysis also these patients can develop paradoxical hypertension, in fact we are all talking about volume overload being one of the cause, but occasionally we have seen patients who develop hypertension after the dialysis and of course the old age drug, which we have now stopped using is nifedipine, this can be very effective in controlling this, so with this I will end my talk.